The most surefire websites to find blockchain and cryptocurrency jobs this year. In Why Every Job Seeker Needs to Get a Blockchain Job, I explained to you how the blockchain industry is exploding right now. The massive demand means higher salaries, more flexibility on the part of hiring employers and easier job searches all around. In How People Are Actually Moving To Careers In Blockchain Technology, I shared success stories of job seekers, both technical and non-technical, who made the switch into this ultra-hot industry. Now let's take a look where to find the best open blockchain and crypto jobs for you. Are you going to look for a blockchain/crypto job in the next 12 months? 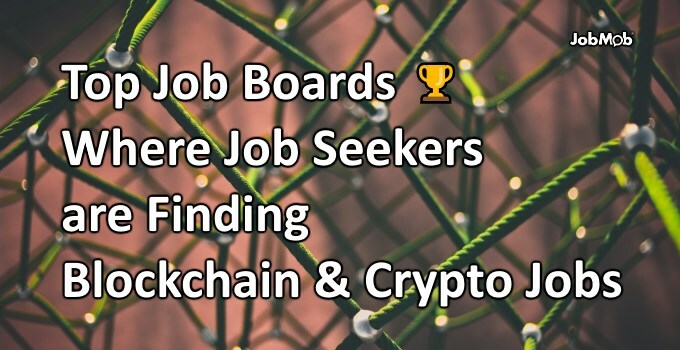 These are the top niche job boards in the blockchain and crypto industries that are focused exclusively on companies in those industries. Don't be surprised that so many of them have similar names. CoinDesk – Search for your next role in Blockchain technology. CoinDesk is the leading digital media, events and information services company for the crypto asset and blockchain technology community. Bitwage – Find Remote Jobs in the USA, EU, and UK through Bitwage Jobs and Personalized Profile Matching. Cointelegraph – a unique platform, Jobs in crypto, powered by Cointelegraph with a list of jobs opportunities inside the blockchain, fintech and crypto industries. Coinality – a free service connecting Employers and Job Seekers with opportunities that pay in digital currencies such as Bitcoin, Litecoin, and Dogecoin. Block Tribe – Blockchain Jobs. Find and advertise blockchain, ICO, bitcoin and crypto-currency jobs. Free blockchain jobboard. Crypto.jobs – the best place to find your next blockchain job. We believe the emergence of blockchain technology and decentralized applications will change the world as we know it, and it’s already happening. We’re on a mission to connect talented individuals to the best blockchain projects, to accelerate the advent of a more decentralized world. BitGigs – A KickAss Bitcoin Job Board! CryptoJobs – CryptoJobs helps connect individuals and companies in the cryptocurrency space! Our team is a huge fan of cryptocurrency and wanted it to make it easier for the industry to grow. Want to find a job in blockchain? Add your resume and let companies find you! Have a job opening at your company? List it for free right now! BlockChain Jobs – Blockchain Jobs is the premier place to create and search blockchain-related job postings. Our mission is to fuel the blockchain revolution by connecting top talent with startups, decentralized projects, and large enterprises. Create a profile, apply to exciting positions, and get access to great companies and training opportunities. BlockChainWorks – Discover the best Blockchain opportunities. Get started to access companies hiring, salary details, a personalized dashboard and our AI Recruiter 🤖. Browse blockchain news, jobs, salaries and learning resources! Jobs in the United States, UK and more. Ethereum Jobs – The premier job board and developer community space specifically for Ethereum by EtherCasts. Blockchain Headhunter – Recruitment of blockchain professionals is the specialty of Blockchain Headhunter. We connect top blockchain employers with the best blockchain talent available. Blockchain Recruitment. Direct & Executive Search. Blockchain Jobs Board. BlockchainJobz – Browse over 1000 blockchain jobs at the hottest companies in the crypto and blockchain industry. No recruiters, apply directly with the companies you like. Cryptohire.ch – The Job Site for the Crypto Valley. Our goal is to help hiring the best talent and finding the most attractive positions in the Swiss Crypto Space. T1000 – a distributed network of blockchain engineering talents started in Silicon Valley, with new nodes joining daily from around the world. Whether you want to dip your toe into the blockchain industry part-time as a side gig or full-time as a remote worker, these freelance marketplaces are a good place to start. You can also find more freelance marketplaces here, many of which will also have blockchain/crypto-related listings. Ethlance – first job market platform working completely on Ethereum blockchain with 0% service fees. Ethlance is a freelance marketplace where payments are made using Ether currency. Bitjob.io -Students Job Marketplace​​. bitJob's technology merges the benefits of micro-gigs and freelancer-centric bidding sites with Ethereum Blockchain, creating the first Hybrid Blockchain Project that allows for peer-to-peer connection with employers and students. Crypto Grind – The easy way to find bitcoin freelance work or pay for jobs using Bitcoin, The next generation in Bitcoin Freelancing for Freelancers and Businesses. Many of the top cryptocurrency exchanges also have their own job boards, mainly because they themselves are hiring. Coinbase – the world’s most popular way to buy and sell Bitcoin, Ethereum, and Litecoin. etoro – the world’s leading social trading network, with over 6 million users from over 180 countries, and more than 2,000 new accounts opened daily. BitMex – Trade Bitcoin and other cryptocurrencies with up to 100x leverage. Fast execution, low fees, Bitcoin futures and swaps: available only on BitMEX. Luno – Luno makes it safe and easy to buy, store and learn about digital currencies like Bitcoin and Ethereum. LocalBitcoins – Get bitcoins. Fast, easy and safe. Near you. If you have a favorite job board, there's a good chance they have a long list of blockchain and crypto jobs too. These bookmarks will send you to either each site's USA-based results or their international search results, and from there you can refine your search. Finally, don't forget to tap the blockchain and crypto industries' hidden job market. What made you think it was time to try looking for a blockchain or crypto job now? Tell us in the comments. Subscribe to JobMob via email and follow me on Twitter for more resources for finding jobs in this year's hottest industry.